It's winter in the capital city, which means while there are still planning meetings galore to attend, there's not much happening outside in the garden. Luckily for me, there are plenty of fun projects that can be done indoors. It keeps me from getting cabin fever or, worse, searching out mysteries to solve. Here's one you might want to try. 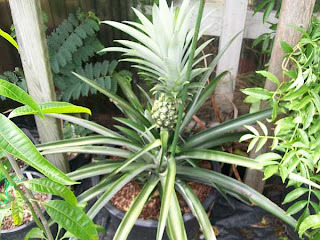 Plant and grow the top of your pineapple! Step 1: Select a healthy pineapple with a bright green top. Look between the leaves. If you can find one with roots, you're that much ahead. Step 3: Remove the bottom inch of leaves and pineapple meat from the stalk. This is an important step. If you leave the sweet pineapple meat on the stalk, it will rot. Step 4: Place in a dry, warm spot for 3 to 7 days for the stalk to dry and form a callus. This helps to keep it from rotting. Step 5: Press the stalk into a pot filled with perlite, vermiculite, sand or any combinations of these. A cactus potting soil will work as well. Bury the stalk up to the just above the first leaf. Step 6: Place in a sunny window. Do not over water. The stalk will sprout in 6 to 8 weeks and grow into an exotic houseplant. 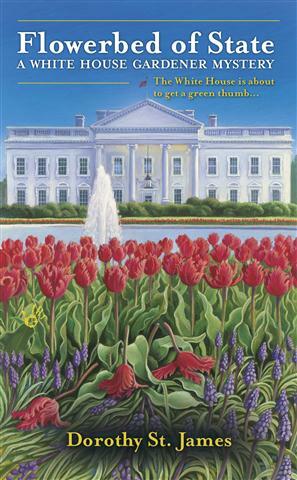 Would you like a Flowerbed of State bookmark that includes instructions on growing your own pineapple top? Shoot Dorothy St. James an email with your contact information and I'll bug her until she mails you one. Okay, I'm off to the store for a pineapple! Thanks, Casey. 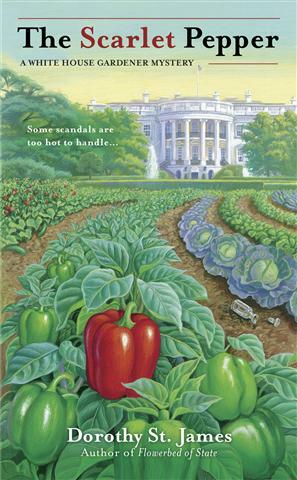 I loved Flowerbed very much, and now I'm going to be itching to get my hands on Scarlet Pepper too. Wow -- I would never have considered growing my own pineapple but will give it a try. Thanks, Casey! You should try it, Erika and Janet! It's fun for all ages. The trick for getting them started growing in the winter is to be sure to keep the stalk dry and warm. Aw! Thank you, Nora! Some exciting things happen with Casey in The Scarlet Pepper. For one thing, she tries her hand at cooking a romantic dinner. Oh my! Hey now! You're making me sound like a dolt in the kitchen, Missy St. James. That romantic dinner wasn't a complete disaster. No one called the fire department. Romantic dinner? Can't wait to read all about that. How fun! Wonder if a pineapple top will grow in Texas. Will give it a go! This sounds like a fun winter project!